The “Blog” of “Unnecessary” Quotation Marks: what do you call somebody who hangs out with musicians? So true. I've never even held a guitar, but I'm pretty sure I could be a "bass player" judging from the the limited amount of death metal I've heard. Maybe they're referring to the fish rather than the musical instrument. I mean, it's death metal, so how could you tell? 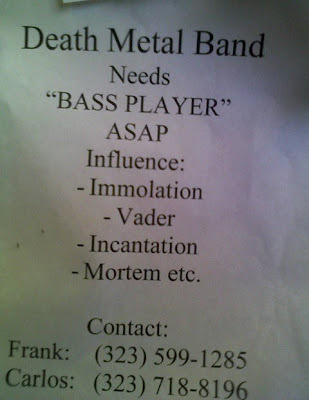 If said "death metal band" needs a "bass player," how are they even a death metal band? They probably just mix the bass out completely anyway. No, oldschool black metal mixes the bass out completely. Death metal can be one of the most complicated forms of music to play. I'm a lead guitarist of 12 years and play a myriad of technical genres. I've also played bass in a death metal band, and it wasn't easy, kids. I always thought the punchline to that joke was "Ringo".